You’ll see the ‘Review these articles’ section at the bottom of your Insights page. Click the ‘Reactions’ tab to see which articles people reacted negatively to most. You should pay particular attention to articles with the most views. If lots of customers are reading these articles and looking for advice on these topics, you need to get them right. For example, if your ‘Getting started guide’ has lots views, but lots of negative reactions, this means that people are having trouble setting up your product and are unlikely to stick around. Improving this article based on your customers’ feedback will make them more likely to convert into loyal, long-term customers. We recommend clicking into each article that needs to be reviewed and reading the conversations your customers have started from them. You can see the exact questions customers are asking and the real problems they’re running into. This will help you weed out any broken content or glaring gaps in information right away. Identify trends in your customer’s feedback to highlight issues that continue to confuse people over time. For example, maybe you’ve created an article about ‘tracking project progress’ a year ago, but customers still have lots of questions about how this works. We recommend clarifying instructions that lots of your customers find confusing, answering questions they frequently ask and adding in use cases they can relate to and learn from. Pro tip: Ask your customer support team to group customer feedback with tags, like ‘Calendar feature questions’ and ‘Confused about projects.’ Then when you go to improve your content, you can search for the relevant tag and address the actual problems your customers have. If you already have content that answers a question customers keep asking, maybe they simply can’t find it. The answer could be buried in a longer paragraph at the end of the article, for example. Re-consider the information you’re prioritizing - is it worth placing that particular answer in your first paragraph? 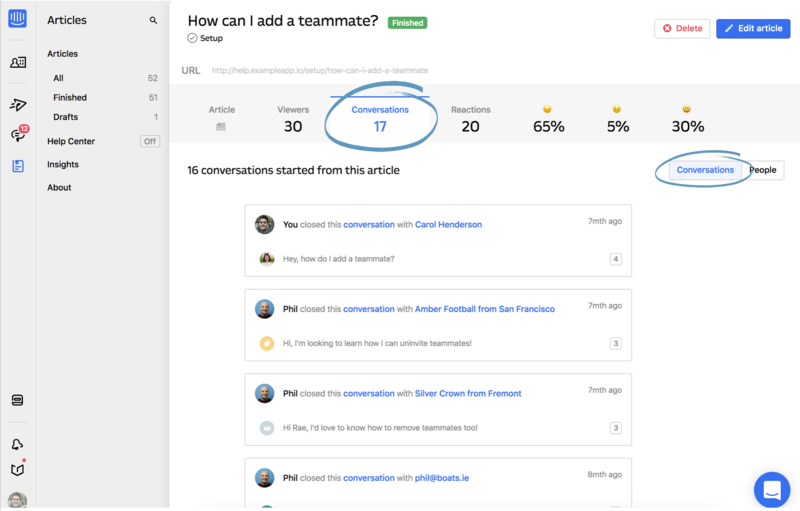 For example, when we published the new Intercom Messenger article we found that lots of our customers were still asking when they’d get the new Messenger. Previously, we had this information at the end of the article, but quickly realised that this section needed to be highlighted at the top. Next, find out which articles are working so you can create more articles just like them.